Whether you’re a kid or an adult, Busch Gardens is full of fun for all ages all year round. With thrilling roller coasters, rides, family-friendly shows, and unique seasonal events, there's always something happening at Busch Gardens. Wondering which roller coasters and rides you have to go on during your visit? Scroll down to read about the excitement of all the rides Busch Gardens has to offer! An award-winning roller coaster at Busch Gardens Williamsburg, Apollo’s Chariot will keep you smiling and screaming for over 4,882 feet of track. You will be taken to a maximum of 210 feet before you have a free-flight sensation at speeds up to 73 miles per hour. Look out for this wild purple track rollercoaster during your visit. You won’t want to leave without giving this coaster a try! Ever wondered what was the first roller coaster with a 90 degree drop? The answer...GRIFFON! It was the first of its kind where you reach 205 feet before you go straight down at 75 miles per hour! Once you’re at the top, it's a view you'll never forget. The anticipation waiting in line is heart-pounding, but trust us when we tell you it’s a one of a kind experience riding this roller coaster. 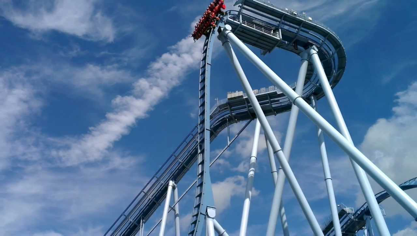 Named after the legendary snow beast, Alpengeist is one of the fastest and most insane roller coasters in the world. After climbing to its maximum height at 195 feet, you will be hurtled through 6 staggering inversions at speeds up to 67 miles per hour! This interlocking, double-looping favorite among park guests is a classic! The Loch Ness Monster, known as Nessie, gives you a peek at Scotland’s most infamous serpent. Nessie will hurl you along 3,240 feet into the air, over water, and through a dark cave. Keep your eyes wide open until you stumble upon the yellow track and the heart-pounding interlocking loop. Even before you enter the park, you can see this massive tower over the trees. Known as the tallest ride in the park, Mach Tower will take you on thrill ride. You will be lifted up into the air until you are looking over the entire park at a height of 240 feet! After you are spun around the top of this giant tower, you will experience a drop at breathtaking speed. If you’re visiting Busch Gardens during the winter season, make sure to check out Mach Tower as it turns into Nacht Tower, a holiday attraction with more than eight million Christmas lights at a birds'-eye view. If you don’t like the feeling of free fall, no need to stress. It is the one time of year where there are no sudden drops. Defy gravity during your visit at Busch Gardens by taking on this high thrill coaster. Tempesto will launch you up into the air and you will race into unbelievably tight turns at speeds of 63 miles per hour. Featuring three launch experiences and a signature loop-the-loop, Tempesto is one you won’t want to miss! Take a tour of the ancient ruins on Pompeii on a flume experience. Even the mighty Roman Empire was no match for the ferocious Mt. Vesuvius, which left Pompeii covered in a blanket of lava and ash. This volcano has long been at rest until now! Hold on tight to your seat as a leisurely boat ride quickly turns into an explosive splash! Not a big fan of high-thrill roller coasters? Don’t worry because Busch Gardens has rides for everyone. Check out these additional rides that are still exciting: Roman Rapids, Le Scoot, Trade Win, Finnegan’s Flyer, Da Vinci’s Cradle, Battering Ram, Der Wirbelwind, and Verbolten. Busch Gardens also has plenty of family and kid-friendly rides! Check out Busch Gardens website for more information about the rides and height restrictions. Busch Gardens has some awesome seasonal events coming up this Fall and Winter. Starting September 15th, Busch Gardens has its annual event, Howl-O-Scream. Filled with fun and fright, Busch Gardens turns into a haunted park and leaves you wanting to go back. This year, they are celebrating 20 years of fear and scares and are adding an all-new era of terror, never seen before. Your visit will be a collection of haunted houses, immersive themed scare zones, challenging escape rooms and darkly entertaining live shows. Starting October 6th, celebrate silly, not-too-spooky fun on Saturdays and Sundays in October. Children ages 9 and under are invited to dress up and join Busch Gardens costume parade. There are additional activities as well including an all-new hay maze, trick-or-treating locations and interactive show. Both of these events end on October 28th so make sure to plan your visit before then. Find additional event information online and check out the Howl-O-Scare factor for families and groups traveling with young children. From November 16th to January 5th, you won’t want to miss Busch Gardens Christmas Town. This beautiful theme park becomes one of the largest Christmas light displays in all of the United States. This event is full on holiday food and drinks, shopping and heart-warming shows. Bring your kids to take pictures with Santa and his little helpers at Santa’s workshop and meet Rudolph and his fellow reindeer at Rudolph’s Winter Wonderland. Christmas Town at Busch Gardens makes the spirit of the season truly come alive. Busch Gardens offers a great discount for groups of 15+! By purchasing the tickets online, you will save $28 per ticket. Just make sure you purchase the tickets at least 2 days prior to your visit. For additional group information and discounts, you can call Busch Gardens group sales specialist at (757) 253-3404 or submit your request online here. Busch Gardens offers one day and multi-day tickets. Tickets are usually $90 for one day, $110 for 2 day, and $120 for 3 day. Right now, you can save 50% on one day tickets when you buy your tickets online by September 30 and visit Busch Gardens Williamsburg by October 28. For multi-day tickets, you can currently save $30 when you buy online and visit Busch Gardens Williamsburg for two or three days. See group tickets by clicking Here. BUSCH GARDENS PARK MAPS. ALL CREDITS BUSH GARDENS. If you are traveling with a big group, a great option would be to rent out a charter bus or school bus to take your group back and forth from the park. The great part about chartering a bus is you get picked up and dropped off right at your doorstep. BookBuses.com provides accurate and affordable quotes according to your needs during your trip, such as custom stopovers, restrooms, WiFi, power outlets, and much more. Instead of having to do intensive research on different kinds of charter buses you can get, head to the BookBuses.com saves you so much time researching different bus charter options as the website platform allows you see and compare all the different charter bus companies so you can get the best price! To make things even easier for you, BookBuses takes care of all the details. All you have to do is book a bus and wait for the day it arrives! Visit bookbuses.com or call (646) 801 6280 for more information and the different bus possibilities for your group travels! Trying to get to Busch Gardens Williamsburg?